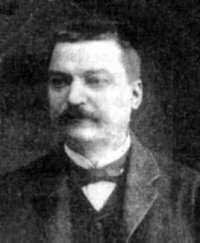 Edouard Lucas was a French mathematician well known for his study of the Fibonacci sequence and the related Lucas sequences named after him. He devised methods of testing for prime numbers – work that was later refined by D. H. Lehmer to yield the Lucas-Lehmer test for checking Mersenne numbers to see if they are prime. Lucas was also interested in recreational mathematics, the Tower of Hanoi being his best known puzzle game. He worked at the Paris Observatory and later became a professor of mathematics in Paris.